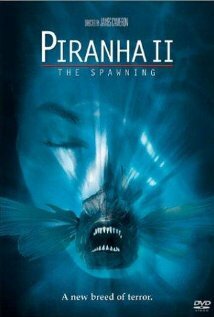 Today, I’m going to be continuing my spotlight of the worst aquatic horror movies with yet another infamous sequel: Piranha II: The Spawning. Piranha II has three credited screenplay writers: James Cameron (The Terminator, Aliens, The Abyss, Avatar, Titanic), Ovidio Assonitis (The Visitor, Tentacles), and Charles H. Eglee (Dark Angel, Dexter, The Shield). James Cameron is also the sole credited director, however, he reportedly was dismissed and had no control over the editing process, which was dictated by producer and co-writer Ovidio Assonitis. Because of this, there is some question of how much of Cameron’s work actually made it to the screen. The cinematographer for Piranha II was Roberto Plazzoli, who also shot such films as Starcrash, Midnight Ride, and Tentacles. The editor on Piranha II was Roberto Silvi, who also cut the films Tombstone, Leviathan, and The Ninth Configuration. The musical score for Piranha II was composed by Stelvio Cipriani, who also created music for the Mario Bava movies Baron Blood and A Bay of Blood, as well as a number of other killer animal flicks like The Great Alligator and Beaks. Aside from Ovidio Assonitis, the other producers on Piranha II were Chako van Leeuwen (Piranha, Piranha 3D, Piranha 3DD) and Jeff Schechtman (Piranha, Invasion of the Bee Girls, Enter the Dragon, Killing Zoe). The effects team for Piranha II included Brain Wade (Van Helsing, Wild Wild West, Galaxy of Terror, Jaws 3D), Maurizio Trani (Troll 2, 1990: The Bronx Warriors), Gilberto Carbonaro (Keoma), Mario Cassar (Leviathan, Cutthroat Island, Final Justice), Antonio Corridori (The Italian Job, The Last Shark), Gino De Rossi (Hudson Hawk, Casino Royale, The Inglorious Bastards), and Glannetto De Rossi (Kull The Conqueror, Dune, The Beyond, Zombie). The cast for Piranha II is primarily made up of Lance Henriksen (The Last Samurai, Aliens, Hard Target, The Terminator), Ricky Paull Goldin (The Blob, All My Children), Carole Davis (Mannequin, The Flamingo Kid), and Steve Marachuk (Eyes of Laura Mars). The plot of Piranha II follows an investigation into a series of bizarre deaths in the waters around a Caribbean island. While it is at first suspected of being the work of sharks or barracudas, it is eventually discovered that the genetically modified monsters from Piranha have unexpectedly returned, and mutated into having the ability to fly. I was replaced after two-and-a-half weeks by the Italian producer. He just fired me and took over, which is what he wanted to do when he hired me. It wasn’t until much later that I even figured out what had happened. It was like, “Oh, man, I thought I was doing a good job.” But when I saw what they were cutting together, it was horrible. In actual fact, I did some directing on the film, but I don’t feel it was my first movie. The idea for James Cameron’s hit The Terminator came from the time period when Piranha II was releasing in Italy. Cameron got significantly ill while powerlessly fretting over the movie overseas in the United States, and had a vivid fever dream about a skeletal, killer robot, which became the primary inspiration for The Terminator’s central machine. Regardless of the unusual situation behind the scenes, Piranha II is still officially James Cameron’s directorial debut, at least on paper. His name remaining on the picture after being fired is apparently due to a contractual stipulation which required that an American had to be credited as the director on the film, or else he would likely have been taken off the movie’s credits, as he initially requested. James Cameron’s b-movie roots interestingly go deeper than just Piranha II. Before his ill-fated directorial debut, he worked on such films as Galaxy of Terror, Battle Beyond the Stars, and Escape From New York as a visual effects artist, production designer, and art director. The budget for Piranha II was astoundingly reported as less than $150,000, which it managed to make back with a marginal profit on a limited theatrical release in Europe. Piranha II has been widely loathed by audiences and critics ever since its release. It currently holds a rating of 3.5 on IMDb, alongside amazingly low Rotten Tomatoes scores of 7% (critics) and 10% (audiences). The fish in Piranha II just look terrible, even in comparison to the less than impressive monstrous stars of the original Piranha. The addition of wings on the creatures just comes off as comical rather than menacing, in spite of how hard the movie tries to make them terrifying. Fortunately, the film wisely tries to keep the fish off screen and out of focus as much as possible, but there is just no getting around how goofy they look when they do show up. Worse than anything else is the fact that Piranha II is astoundingly slowly paced, and doesn’t do much to keep the audience’s attention. Honestly, this is one of the most boring movies I have watched since I finished the IMDb Bottom 100, and that is saying a lot. I was able to focus on an Italian Franco Nero movie with no subtitles better than I could stay tuned into Piranha II. Overall, Piranha II is a train wreck of a movie with little to no redeeming value. However, the behind the scenes stories are really fascinating and interesting, enough so that it is almost worth watching through the movie to get some context. If you aren’t planning to do some reading for the sake of trivia, though, you should avoid Piranha II at all costs. 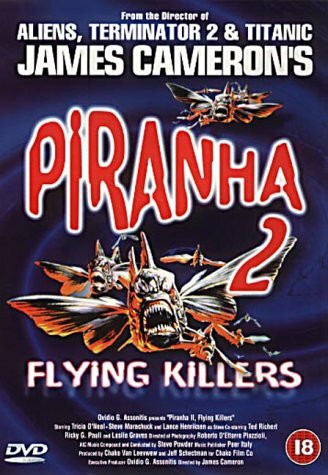 However, the clips of the flying piranhas are worth checking out, because those are hilarious.